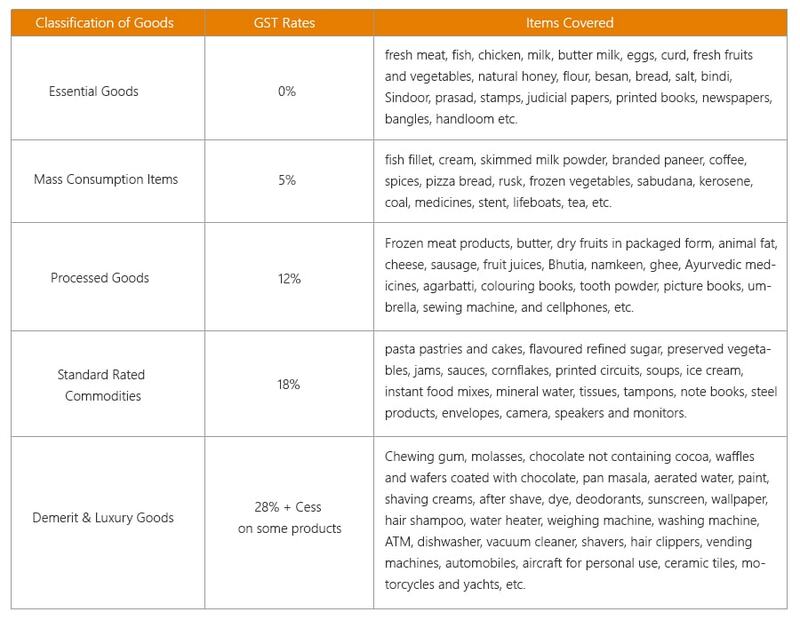 GST rates are fixed for different products. Get insight on the basics. The most awaited Tax Regime is now in! The GST Council met on May 18, 2017, to fix the GST rates for 2017 to be implemented from July 1, 2017. The council which is the apex body for the new tax regime finally took the decision for setting the GST rates for 1211 items falling into different categories. There are total five different rates under which the products are being classified, viz., 0%, 5%, 12%, 18%, and 28%. The majority of the goods are being put in the slab of 18% GST rate. As per the updates, it has been evaluated that 81% of the total items fall under 18% or below GST slabs, while the remaining 19% of the goods will be taxed at 18%. The food grains shall be cheaper for the consumers after the rollout of GST regime. Capital good, industrial intermediate items to be taxed at 18% under GST. Sugar, tea, edible oil, coal shall be taxed at the rate of 5%. Cereals, milk shall be taxed at the rate of 0% under GST. 43% of items fall under 18% rate slab. 7% of items to be under 0% rate slab. To understand the various products falling in the different slab, the following table can be helpful for you. The rates specified above are going to be rolled out from the month of July 2017, making the Indian economy fall under a single system of indirect taxes. It is expected that the economy shall definitely get relieved from various drawbacks of the earlier tax regime out of which the cascading effect is the worst one. It is further believed that Indian economy shall be balanced leading to a reduction in the inflation rates and rising the GDP. So now it is the time to presume that the investments in the Indian companies as well other avenues shall be truly beneficial for the economy, and one shall have tremendous growth opportunities. You too must begin investing in the best mutual funds in India to ensure your financial growth with the rising economy. We, at MySIPonline, are entrusted to provide the convenience of investing in the mutual fund plans. Get associated with us to experience the world of simplified investments and accompany the economic development after GST rollout.